The National Curriculum for English in Year 2. Hover over blue text to see non-statutory examples. En2/1e give well-structured descriptions, explanations & and narratives for different purposes, including for expressing feelings. En2/2.1h reread these books to build up their fluency and confidence in word reading. En2/2.2d explain and discuss their understanding of books, poems and other material, both those that they listen to and those that they read for themselves. En2/3.1d write from memory simple sentences dictated by the teacher that include words using the GPCs, common exception words and punctuation taught so far. En2/3.2d use spacing between words that reflects the size of the letters. 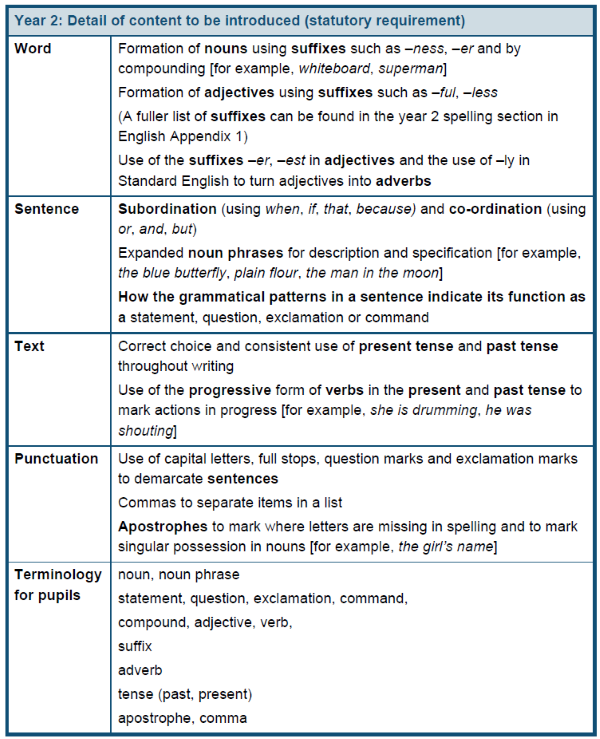 En2/3.4c use and understand the grammatical terminology in English Appendix 2 in discussing their writing and reading.